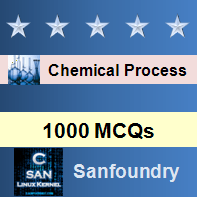 This set of Chemical Process Calculation Multiple Choice Questions & Answers (MCQs) focuses on “Material Balance without Reaction-I”. 1-2. A membrane is used for separation of gases from waste. If the feed stream contains 20% CO2 and 80% SO2 and the product contains 25% CO2 and 75% SO2. Assume that the waste stream amounts to 80% of the input stream. 1. What is the composition of CO2 in waste stream? Explanation: Mole balances for both the gases. 2. What is the composition of SO2 in waste stream? In distillation, a liquid mixture is boiled to produce a vapour of different composition that moves away from the liquid. Explanation: In distillation, a liquid mixture is boiled to produce a vapour of different composition that moves away from the liquid. 4-5. In a distillation column for a feed of1000 kg the output is 80% of the feed and remaining 20% is waste. The feed contains 20% of Acetone and rest Water. The product contains 20% of Acetone and 40% of Water. 4. How much Acetone is there in waste? Explanation: Mass balance for each component. 5. Moles of water in waste? Explanation: A tie component full-fills a, b, c all three conditions. 7-8. For the given drying process, a material (Called SRU) is dried and feed and outputs are as shown in the figure. 9-10. A batch of 20% of Acetic acid is prepared by mixing the Acetic acid of two containers A and B. A (400 kg) contains 80% of Acetic acidand B contains 15% of Acetic acid. 9. How much kg of acid is prepared? 10. How much B in kg is used?